The following article, written by Associate Jeff Bittenbender and Landscape Designer Siyu Xiao, is part of an ongoing series that focuses on a select topic of inspiration for the month. The focus for August is “Progress”. In April 2017, CRJA-IBI Group entered The Driverless Future Competition, hosted by Blank Space, in partnership with the City of New York, New Lab, AIANY, and Fast Company. The team was comprised of Jeff Bittenbender and Siyu Xiao of CRJA, along with eight transportation engineers and graphic designers from multiple IBI offices. 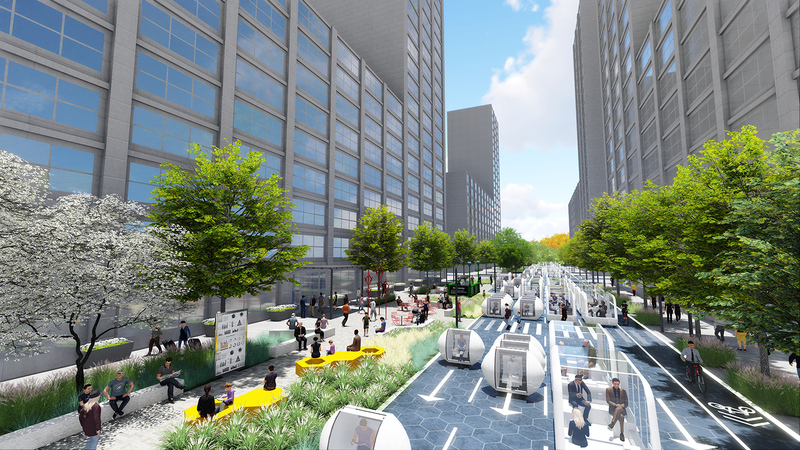 Using New York City as its canvas, the goal of the competition was to envision the future of the urban streetscape in a fully autonomous transportation environment. Today on Manhattan Island, a typical major Avenue is roughly 100 feet wide, with the vehicular roadway comprising a staggering 70% of the space. The ground plane is a sea of pavement, comprised of two 15 foot wide sidewalks, 5 one-directional traffic lanes, 2 lanes of on-street parking and 1 bike lane, all of which are used to capacity, but only for the few hours a day during the commuter surges. Using expected efficiencies for autonomous vehicles including vehicle spacing, lane width reduction, parking reductions and communication with intersections, the transportation experts on our team calculated that 42% of the roadway could be reduced in size and given back to the people, while still accommodating the same capacity of vehicles. 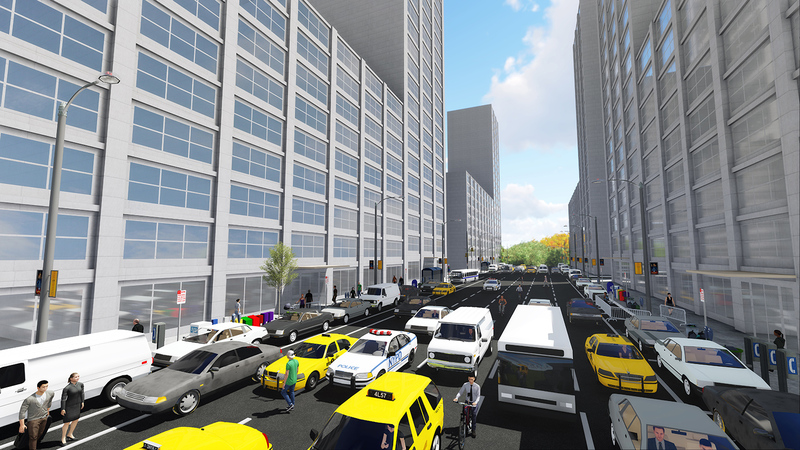 In addition to studying the efficiencies of Autonomous Vehicles, we conducted extensive research into the existing mobility conditions within the island of Manhattan. On average, a staggering 1.61 million people descend onto the island each and every weekday morning, and 1.61 million people vacate every evening, all doing so from a handful of entry/exit points on the island. A tidal surge of people navigate from these points of entry to their place of business during the morning commute and again in the evening, but what about the hours in-between? 100 foot-wide Avenues with 5-lanes of capacity are needed at rush hour, but not during off-peak hours. As vehicles are getting smarter and more technologically advanced, so to must the street they use, functioning in a similar capacity to the surge of a tide, changing the number of travel lanes, the travel direction and as demand requires – Tidal Lanes. In order to facilitate tidal lanes, paint would no longer be used for lane markings, but instead be made up of a grid of LED lights embedded in the pavement, illuminating as needed to show traffic and bike lanes, motion-sensored pedestrian crossings, etc. The lights would be programmed to be dynamic, adjusting the number of lanes, lane direction, and use of lane based on tidal demand. The LED embedded pavement would be made of modular pavers with photovoltaics that can be replaced quickly and easily, as well as charge Electric Vehicles as they pass overhead through induction, all technologies in prototype or beyond. Surplus energy from the solar system would be used for pedestrian lighting or fed back to the grid. As the traffic lane quantities and locations are dynamic, the roadway curb becomes nearly obsolete, particularly since in a dense urban environment such as Manhattan, AVs will likely only be allowed to travel at low speeds, 10-15 mph. This speed limit seems low, but today during rush hour in Manhattan, nearly 90% of streets have an average vehicle speed under 10mph. Therefore, limiting the speed of AVs would not reduce efficiency. We proposed to eliminate the vertical roadway curb which would allow for sections of road to be closed off temporarily to vehicles in order to host events such as block parties, concerts, road races, etc. 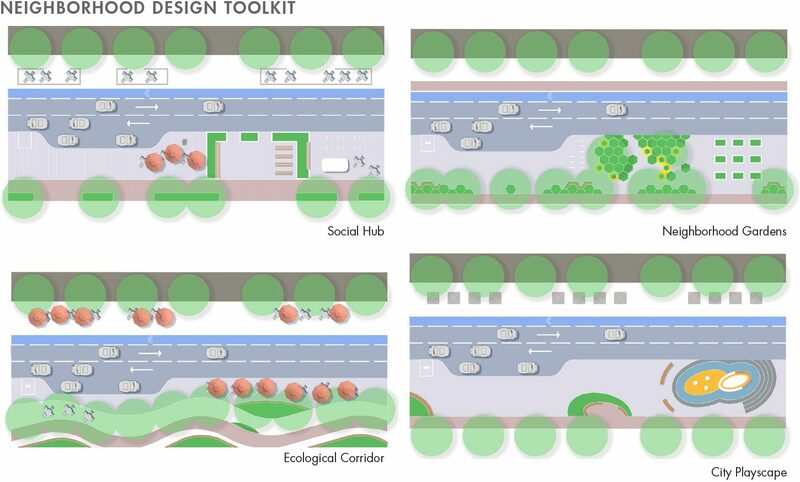 This endlessly flexible street will provide for maximum use and benefit by the people of New York and its guests, while at least maintaining, if not increasing efficiency of mobility. 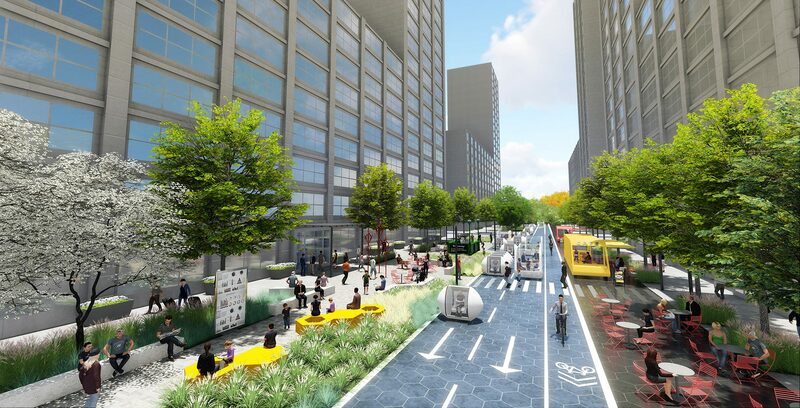 By leveraging the future autonomous vehicle to its greatest potential, every New Yorker will gain 69 square feet of new public space. 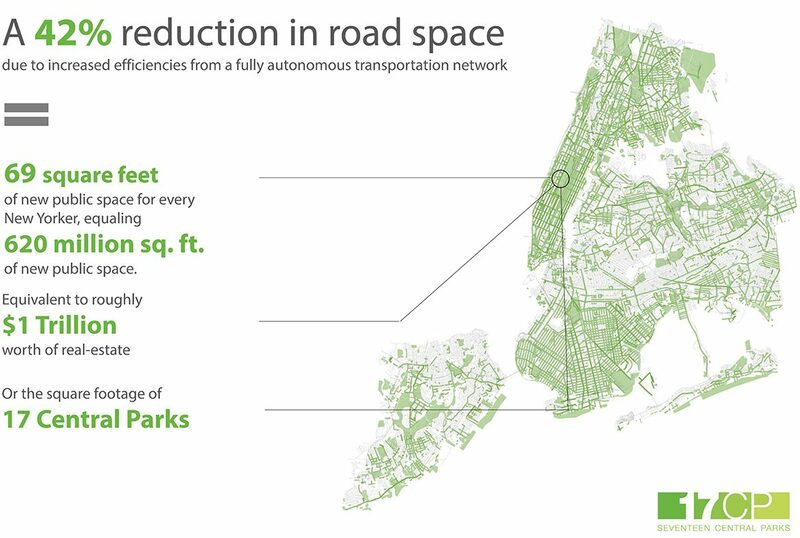 The 620 million square feet of newly reclaimed road space, which is the equivalent to the size of 17 Central Parks, can be transformed into urban ecological corridors, connecting the scattered neighborhoods of Manhattan in ways not previously possible. Parks and public open space will no longer be limited to isolated areas of the city, but continuous urban ecological corridors will link the larger public spaces and create a much more hospitable pedestrian environment. The identity of the regained public space can be re-envisioned to reflect the needs and character of each community. NYC TODAY: For human use, the current streetscape in New York City is completely inhospitable. Pavement runs from building face to building face and only roughly 30% is dedicated to the pedestrian. It is long overdue to return the streetscape back to the people. FUTURE PEAK HOUR: During peak travel hours all traffic lanes will be in use, and projected lane markings will be able to change directions as needed to accommodate increased traffic flow during morning and early evening rush hour. FUTURE OFF-PEAK HOUR: During off peak hours, some traffic lanes can be converted to public open space, providing additional flexible opportunities activated through a wide variety of programming. While many of these ideas may seem far-reaching or idealistic, it is important to envision the possibilities and what we want our future to look like, before implementing strategies for how we get there from today. Stay tuned!